Assad’s legitimacy: Has the administration flip-flopped on recognizing Assad as the ruler of Syria? Does the U.S. Recognize Assad as Legitimate Now? Did it Ever Not? 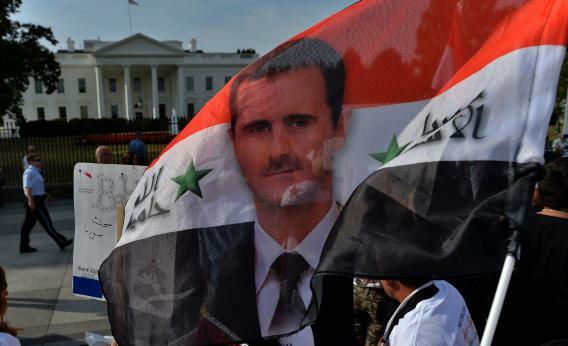 Supporters of Syrian President Bashar Al-Assad wave a Syrian flag with Assad’s flag on it during a demonstration in front of the White House in Washington, DC, on September 9, 2013 urging US not to attack Syria. So does that mean the administration has flip-flopped on its earlier position and is now engaged in negotiations with a government it previously didn’t recognize as legitimate? Well, sort of. The problem is that even by the standards of international law, recognition and legitimacy are nebulous concepts and the Obama administration has actually muddied the waters even further. The traditional practice of the United States government has been to recognize countries rather than governments. With a few notable exceptions such as Woodrow Wilson’s brief non-recognition of Mexico’s dictatorship or the years during which the U.S. recognized Taipei as the legitimate government of China, the U.S. just generally recognizes whoever controls all of, or at least most of, the territory of a given country. This isn’t the same thing as diplomatic relations. The U.S. may have a chilly to non-existent relationships with Raul Castro and Kim Jong Un, but much as we don’t like them, we do in fact recognize them as the rulers of Cuba and North Korea. This is why it was a bit of a surprise in 2011 when Clinton announced that the U.S. would recognize the anti-Qaddafi Transitional National Council “as the legitimate governing authority for Libya, and we will deal with it on that basis.” The rebels took over Tripoli a month later so this unusual state of affairs didn’t last very long. In the Syrian case, the State Department made it clear that Obama was talking about a “political recognition, not a legal recognition,” which would entail essentially treating the rebels as the Syrian government and Assad as an opposition military force. This is in contrast to the Arab League, which has actually allowed the opposition to take over Syria’s seat at summit meetings. All the same, Assad is the one with (at least most of) the chemical weapons, so if your priority is removing them from the battlefield rather than putting Syria on a path to better governance, he’s the one you need to deal with, “legitimate representative of the Syrian people” or not. Diplomatic moves like unrecognizing a dictator make a lot more sense when you assume he’s going to fall within a few months. That doesn’t really look like a safe assumption anymore, so for now, the legitimate ruler is the guy holding the sarin-packed rockets. The bigger concern, of course, is not Assad’s legal or diplomatic status, but whether the U.S. will find itself in the position of making concessions that strengthen his position within Syria in order to accomplish the goal of chemical weapons removal.